Shorty Produkshins sends a friendly reminder to The World of the ongoing “End of Month Graphics Sale,” which takes place every month from the 21st of the month and up until the very end! Whether you need graphics for album art, branding and/or logo design, Shorty Produkshins can HOOK YOU UP! Interested in taking advantage of our monthly design services? Contact us today with PROMO CODE: BRANDSOCIAL21-1 for your design needs! The rumors you have heard are true! Every month, beginning from the 21st of every month and ending on the first of the next month, Shorty Produkshins is throwing a monthly Graphics sale! The best part is that you will receive $50 Off current graphics specials! Keep in mind, these deals are only available once a month. 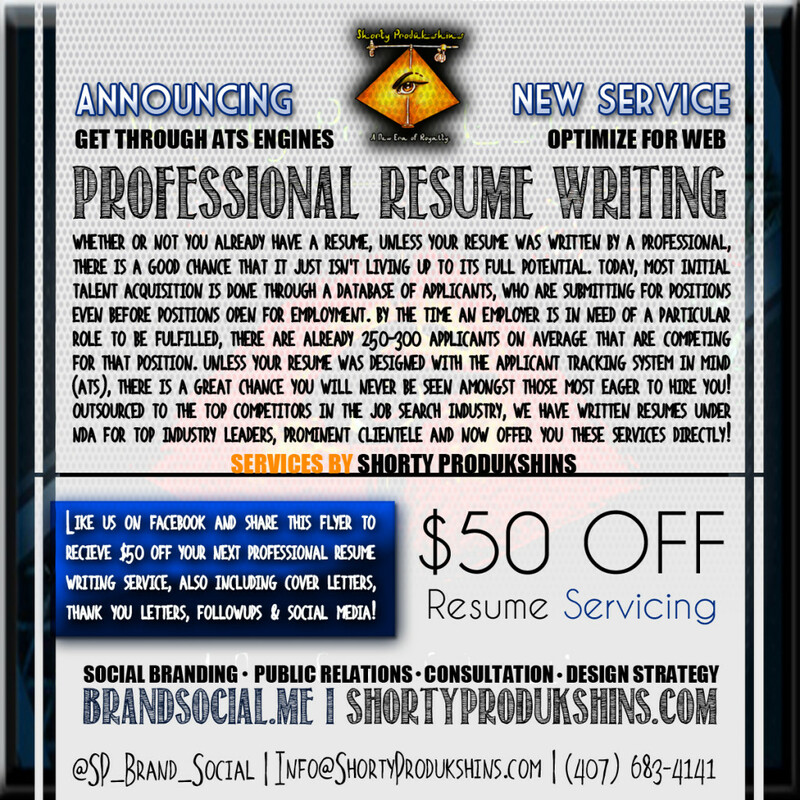 Shorty Produkshins still services you with special discounts and rates throughout the month! Next time you need your graphics done with a professional, seek Shorty Produkshins. This entry was posted in The Vault. | 2003 to 2016 and tagged 2014 January, Announcements, Brand Story, BrandYou, Budgets, Collaboration, Contact Shorty Produkshins, Design, Design Strategy, Discounts, Graphic Design, Jessica N. Abraham, LA Talk Live, Letter from Mz Shorty P, Local Marketing, Logo Design, Mobile Marketing, Must See, Mz Shorty P, Orlando, Orlando Business, Philadelphia, Philly, Pittsburgh, Product Review, Products, Punxsutawney, Sabir Bey, Sales, Services, Shorty Produkshins History, Small Business, Social Media, Social Network, Specials, Story Telling, Storytelling, Tampa, Teamwork, Testimonial, The Sabir Bey Show, TV Show, Video on January 27, 2014 by jessicanabraham. The announcement is here! It has been decided that in celebration for Shorty Produkshins 10th year in business that the company will remain dominant in both central bases — Orlando and Pittsburgh — while continuing to service the World! As crazy as this sounds, it has been a difficult decision for owner, Jessica N. Abraham, who has been questioning the need for both locations, as most commerce actually takes place via the web. The decision to remain local to both Pittsburgh and Orlando Metropolitan Areas came after almost two-years of deep thought and factoring. It is, while often overlooked, important for virtual businesses to have a local base. The reason behind this is for many reasons, including community support, local marketing endeavors, and business operations. For those who may not know, Shorty Produkshins was once a name give to the company (previously spelled “Shorty Productions“) to yield credibility at a time when the company was merely a dream for artists creating music and seeking to have it be heard. Over the years, the company evolved from a Record Label (with attached Shorty’s Playground Recording Studio) into what is today an Internationally recognized, in-demand Internet Marketing Company. While specializing in Social Branding and Event Marketing to brand’s across the Globe, Shorty Produkshins often services small businesses, Advanced Internet Marketing and Search Engine Tactic, in Orlando and Pittsburgh. Why discontinue these services now? In addition to Orlando and Pittsburgh bases, Shorty Produkshins has found itself servicing areas like Atlanta, Memphis, Los Angeles, San Francisco, Detroit, Philadelphia and Las Vegas with Internet Marketing on a pretty regular basis! Does this mean expansion into these areas in the future? The future remains to be said, but “near distant” areas, such as the famous Weather Capital of the World, Punxutawney, and Tampa will also begin feeling the ripple of Shorty Produkshins Internet Marketing wrath! Interested in becoming part of the process? Contact us today for more details! This entry was posted in The Vault. | 2003 to 2016 and tagged 2013 August, Atlanta, Aug 2013, Brand Story, Career Opportunities, Collaboration, Contact Shorty Produkshins, Detroit, Internet Marketing News, Internet Marketing Orlando, Internet Marketing Pittsburgh, Jessica N. Abraham, Las Vegas, Local Marketing, Los Angeles, Memphis, Miami, Mobile Marketing, Offices, Opportunities, Orlando, Philadelphia, Philly, Pittsburgh, Press Release, Punxsutawney, Services, Shorty Produkshins History, Story Telling, Storytelling, Tampa, Work for Us on August 8, 2013 by jessicanabraham.